With winters on the go, we all tend to sleep a little late, be a little more lazy and miss on our exercise sessions because is it cold and freezing outside. We can’t even think of going for a walk like we used to during the summers. But wait as it is a great time to go for a winter walk. There are some amazing benefits of taking a stroll in the park during the freezing winters. Let us know some of these wonderful health benefits which can make you a healthier person. Generally during winters we retire to a lazy and relaxed mode. We don’t want to move an inch because we just want to stay in bed and enjoy the warmth of the quilt. Because of this we go in an inactive mode. That freshness and zeal that we experience during summer season, it is all gone during the winter chills as we want to sit at one place and do nothing. And because of this we feel colder and less active. Winter walking keeps us in a healthy active mode. We do not retire to a lazy phase where we just want to relax and do nothing. During winters, when we are in a static phase, it is important to engage in some activity which can help us sweat a little and burn a few of our calories. Though you will not have a similar experience as you have in summers but you surely feel a lot better and warmer just by walking a few yards in the outdoor. This will open up your pores and you will feel fresh and nice. As soon as the month of December arrives, we all start to hibernate like the animals. This reduces our exposure to the sunlight which is so much essential for the good health of our bones. We all know that sunlight is the best source of Vitamin D which is so much needed for our bones. Hence, it is very important for us to go out for a healthy walk during winters so that our body gets exposed to the sunrays. This will ensure better health. It is a great way to motivate yourself to do something better. When you walk on a treadmill, you start and stop as and when you want as the machine is under your control. But when it comes to walking, sometimes you are forced to walk a few more steps despite you are tired. This motivates you to perform better, walk a little extra, burn a little more calories, sit a little less at home and become a livelier person. Going out in the sunlight, meeting new people and enjoying the vibrancy all over can really do wonders to your mood. Sitting at home in the warm and cozy environment can sometimes be a little depressing with no change in life. When you go for a regular walk, you feel charged and happy as you can see so many activities happening around you. A study at University of Washington in Seattle concluded that women in the age bracket of 19 to 78 years, who took a brisk, outdoor walk for 20 minutes on a daily basis had better mood, improved sense of well-being and higher self esteem at the end of the eight-week study which is a wonderful observation when it comes to something as simple as a walk. 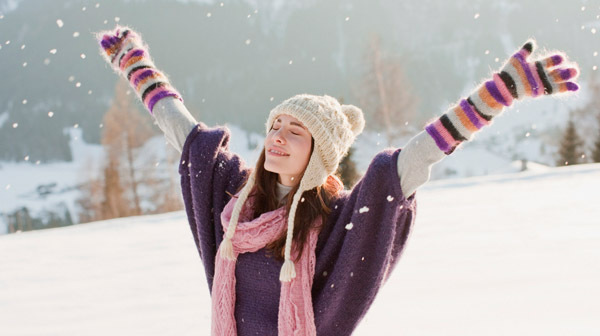 These are some of the highly beneficial aspects of including a daily walk in your routine during the winter months so that you stay happy and lively even on the dullest days of the season. No matter which month it is, keep walking and you will feel good!!! !